I talk to the kids in a normal voice but we do lots of silly talking (questions, one-sided conversations) and kisses. I found myself talking and giving little kid kisses to Husband on the couch this weekend when we watched TV. Blah! I'm hoping that when I get back to work my constant kid centered brain will realign a little bit. Here is an example of kid play time with Mommy, Esq. I try to "steal" their honey (hiding in their necks). I think the kids are so different but they totally laugh the same. Grammie, Bumpa and Uncle Andrew came by for a visit. Husband got in some time with his "Mini-Me". Helen (aka, Auntie Honey) also came by for a weekend visit. The kids wore hats knitted by Julie (Georgie's Mom) for a walk OUTSIDE! It was warm but the sidewalks are a mess and even The Bob Stroller had problems so we will have to wait for more melting before we can go on regular walks. The kids had a Board Meeting and some Tummy Time. Those hats are super cute!! How old were your twins when you first started using the Bumbo seats? Oh my, your babies are so sweet. I just love those eyes. 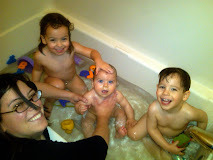 You can so tell how much you are enjoying mommyhood - you can see it in your kids. They are so happy and content. Good luck with starting back to work soon. They are so adorable and the laughs are definitely the same! It's pictures and videos like this that make me think about how slow the next two months will be before I get to meet my little one! They do sound just alike! Too funny. And I think my new favorite picture is that one of both of them in their hats. TOO CUTE!! !